Yaffe's false statements made the March 27, 2008 Order a nullity as it relied entirely on a non-existent March 18, 2008 Order. Yaffe's deliberate false statements were made to fraudulently induce any subsequent court to rely upon such false statements and base its judgment upon such false statements. The U.S. District Court, in turn, relied upon the March 27, 2008 Order as a basis for its judgment. The U.S. District Court found at page 19, lines 7-15 (SER 0242) of the Report and Recommendation of the Magistrate Judge, adopted by the U.S. District Court, that “Fine” did not have standing to file a disqualification against Judge Yaffe. The July 13, 2010 Minute Order shows this conclusion to be false. The U.S. District Court also falsely stated that the March 27, 2008 Order struck both the March 25, 2008 Notice of Disqualification and the March 25, 2008 Code of Civil Procedure section 170.3 Objection to Judge Yaffe (Id., lines 14-15). The March 27, 2008 Order only mentioned the March 25, 2008 Notice of Disqualification and did not mention the March 25, 2008 CCP section 170.3 Objection to Judge Yaffe. A handwritten note on the March 25, 2008 Notice of Disqualification by Connie L. Hudson, the Deputy Clerk, shows this to be the document stricken as ordered by the March 27, 2008 Order (SER 0083). The July 13, 2010 Minute Order refers to a March 20, 2008 Minute Order as the actual document striking the February 19, 2008 “Motion to Disqualify L.A. Superior Court Judges Receiving Money from L.A. County.” Such March 20, 2008 Minute Order (SER 0077-0078) did not give any valid ground for striking in the four grounds that were set forth in the Minute Order. The February 19, 2008 Motion was not vitiated by the March 20, 2008 Minute Order as, (1) it was not directed at all judges of the superior court, only those who had received payments from L.A. County, a party to the case (Judge Yaffe had not disclosed whether he had received such payments as of February 19, 2008); (2) it was not a motion for reconsideration; and (3) it was not a CCP section 170.3 Objection as it was not directed to a single judge as the L.A. Superior Court judges who had received payments from L.A. County had previously transferred a case out of L.A. County as shown in the case of Sturgeon v. County of Los Angeles, LASC Case No. BC 351286 as set forth in the February 19, 2008 motion (SER 0047). The March 25, 2008 Notice of Disqualification was based upon the March 20, 2008 Minute Order. (SER 0083-0084.) It showed that if Judge Yaffe believed the February 19, 2008 Motion to be a CCP section 170.3 Objection to him personally, he was bound under the law to strike the motion within ten days of filing. He did not do such and waited until 30 days later consequently causing his disqualification. In summary, 28 months or approximately two and one-fourth years after the March 27, 2008 Order, Judge Yaffe has finally admitted that he deliberately made false statements in his March 27, 2008 Order. Judge Yaffe’s admission of the false statements is crucial to the Habeas Corpus proceeding. The U.S. District Court based its judgment, and relied upon Judge Yaffe’s deliberate false statements. The Ninth Circuit affirmed the U.S. District Court’s decision and the U.S. Supreme Court denied certiorari without questioning Judge Yaffe’s deliberate false statements. Finally, Judge Yaffe does not deny that he and L.A. County committed “fraud upon the court” by not disclosing the L.A. County payments to Judge Yaffe at the outset of the case on June 14, 2007. 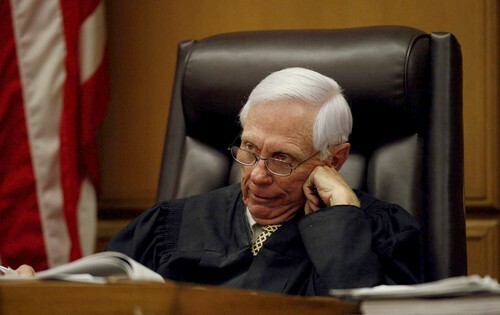 Judge Yaffe further does not deny that he should have immediately disqualified himself on June 14, 2007 based upon the payments from L.A. County, a party appearing before him. This information is being sent to the U. S. Supreme Court immediately after being discovered on Pacer in the U.S. District Court case, and prior to being received by mail from the L.A. Superior Court, Judge Yaffe and its counsel in the U.S. District Court case or being received by mail from the L.A. Superior Court in the underlying case. Please consider this information in your deliberations on the Petition for Rehearing. Los Angeles, CA Full Disclosure Network has learned that Superior Court Judge David Yaffe plans to step down from the bench in October 2010, prior to the expiration date of his elected term of office. The reasons? Presumably by retiring early the Governor will have an opportunity to name his successor rather than having a contested election to fill the spot. But there are other possible reasons for Judge Yaffe's decision, not the least of which could be the long grueling case of jailed anti-trust attorney Richard I. Fine. Yaffe ordered Fine to be held in solitary "coercive confinement for contempt of court indefinitely, without bail, without a hearing and without a release date. The Judge's Order stated that Fine would not be released from jail until he appeared at a Debtors Hearing in Deptartment 1A and provided the court with information regarding his assets. Fine had contended he would not answer the questions until he had exhausted all his appeals as the Judge's order was void and illegal. The Court had apparently set a Debtor Hearing date of June 14, 2010. As the date neared a volunteer for Richard Fine attempted to arrange with the Court and Sheriff Baca's office for transportation to the Court. Janette Isaacs related in this Email that both the Court and the Sheriff refused to transport Dr. Fine to the hearing. She was told that "budget cuts" prevented them from providing the transportation. Read her Email report to Full Disclosure as to what happened. Los Angeles Superior Court Judge David P. Yaffe engaged in fraud upon the court, obstruction of justice, misappropriation of funds, bribery, violation of Code of Judicial Ethics Canons 4D(1), 3E(2), 3E(1) and 2, violation of CCP § 170.1(a)(b)(A)(iii), violation of California Constitution Article 1; §§ 7 and 15 (due process) and section 3 (Petition Government for Redress of Grievances, violation of U.S. Constitution Fifth Amendment and Fourteenth Amendment (due process), First Amendment (Petition the Government for Redress of Grievances) and Article II, Clause 2 (Supremacy Clause), violation of the “Intangible Right to Honest Services (18 U.S.C. § 1346, and violation of his oath of office, in his actions in the case of Marina Strand Colony II Homeowners Association v. County of Los Angeles, LASC Case No. BS 109420 (Marina Strand case) and its ancillary contempt proceeding against Richard I. Fine (FINE). The Marina Strand case was a writ of mandate proceeding brought to invalidate the County Board of Supervisors May 15, 2007 illegal certification of an environmental impact report (EIR) applied for by Los Angeles County and its co-applicant Del Rey Shores Joint Venture and Del Rey Shores Joint Venture North (collectively Del Rey Shores) to re-develop the Del Rey Shores Apartment Complex in Marina Del Rey, California from 200 plus units to 500 plus units extending five stories high with “sails” on the roof resulting in the buildings rising to approximately 100 feet above the ground level of the surrounding two story buildings . The proposed redevelopment also increased the parking spaces from 200 plus to 1,000 plus. I. Judge Yaffe Committed “Fraud Upon the Court” By Presiding Over the Marina Strand Case While Having Received Illegal Payments From Los Angeles County and Not Having Disclosed Such Thereby Voiding All of His Actions. II. Senate Bill SBX 211’s Retroactive Immunity is Limited to Just the Payments of the County Benefits to the Judges and Nothing More by its Terms. IV. Judge Yaffe Violated CCP Section 170.3(c)(4) by Refusing to Leave the Marina Strand Case After he was Disqualified and by Refusing to Send the File to the Presiding Judge for Re-Assignment. V. From the Outset of the Marina Strand Case Judge Yaffe Violated Canons 4D(1), 3E(2), 3E(1)2 and CCP Section 170.1(a)(b)(A)(iii) by Taking the Los Angeles County Money, Not Disclosing Such and Not Disqualifying Himself. VI. Judge Yaffe Violated CCP section 1216. VII. Judge Yaffe Violated Federal and State Due Process, His Oath of Office and the Supremacy Clause of the U.S. Constitution by Judging his Own Actions in the Contempt Proceeding Ancillary to the Marina Strand Case. IX. Judge Yaffe Violated Due Process by Holding Fine in Contempt and Ordering him and Keeping him in “Coercive Confinement” Without a Hearing. X. Judge Yaffe’s Actions are Not an Isolated Incident But a Continuing Course of Conduct that Mandates his Removal. Judge Yaffe is the “tip of the iceberg” of the largest judicial scandal in American history. In Los Angeles County alone, approximately $300 million of illegal payments have been made to Los Angeles Superior Court judges from Los Angeles County since the late 1980’s. Illegal payments have been made to superior court judges in 55 of the 58 California counties. Approximately 90 percent of the court of appeal justices received illegal county payments when they were superior court judges. Based on their biographic records, five of the seven California Supreme Court judges, including the Chief Justice, received illegal county payments when they were superior court judges. All of these superior court judges, court of appeal justices and superior court justices received retroactive immunity as of May 21, 2009 from civil liability, criminal prosecution and disciplinary actions for the illegal county payments. They did not receive immunity for failure to disclose the payments, “fraud upon the court”, federal criminal acts such as violating the Intangible Right to Honest Services – 18 U.S.C. 1346, violating federal and state constitutional due process and the right to petition the government to redress a grievance. At the present time California has “the best judiciary that money can buy”. The corruption of the California judiciary due to the illegal county payments exceeds that of any country in the world as it affects over 90 percent of the judges and justices. The commission must remove Judge Yaffe and then remove every other judge and justice who has taken illegal county payments until the integrity of the judiciary is restored. I, Richard I. Fine, declare under penalty of perjury under the laws of the State of California that the foregoing facts are within my personal knowledge and if called to testify, I could and would competently testify thereto. Executed this ___ day of June, 2010, at Los Angeles, California.